I guess maybe but I can't see how it would during that pass and then not do it during an identical pass when I re-ran everything in line? I think the thought that the was caused by static is the winner as once that was mentioned I did see that my dust collection hose's connection to the shopvac literally rested on the x-axis stepper motor. Given that the picture appears to be a jump forward on the x instead of something being held back, I'd say this is the most probable answer now. Re-posting the OP pic since the link got broken and I can't edit the post for some reason. Bare copper wire(stranded works best it seems) INSIDE the DC hose, and dead end it maybe on reinforcing wire of the hose itself. Don't let it touch any metal on the dustfoot. I've got a steel can DustDeputy, so I just ran the copper to the base canister and screwed it, then on bottom of canister I put a mish mash of heavy bare iron and cutoffs of grounding rod on wire screwed to canister base so it drags on bare concrete floor. Probably better to ground it to the Fein motor, but it works. Every year at this time people who haven't grounded the hose have problems. 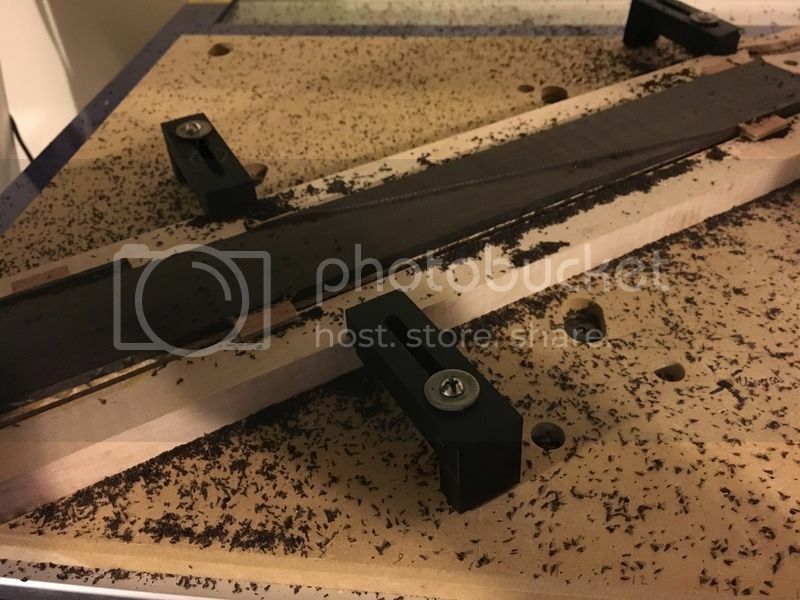 I'm gunna try and get to this tonight, but had a question.... if my dust collection right now (at least where the CNC is) is just a shopvac I'm gunna have a hard time grounding. 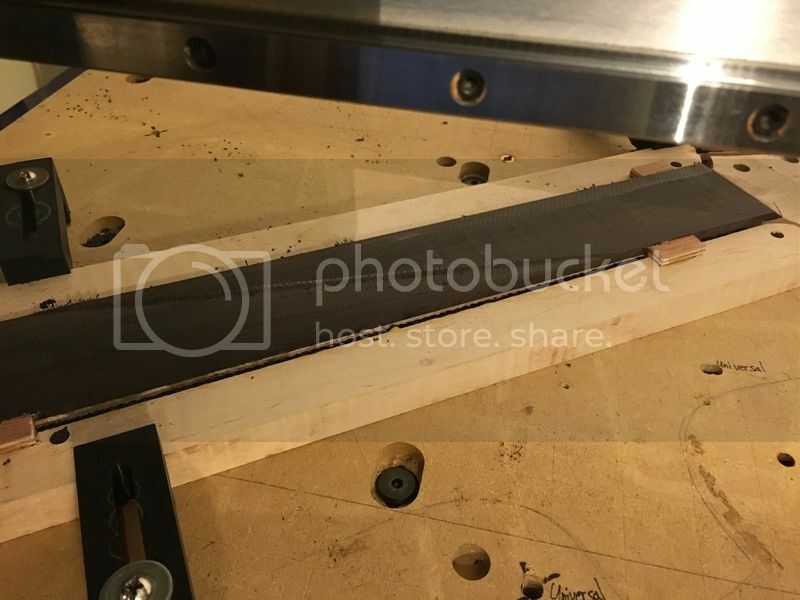 Can I ground to the metal of the Shopbot itself? This would be handy as it would allow me to run wire from the dust shoe, up the hose, ground it to the Shopbot frame there, and then have another leg of wire go down the hose towards the Shopbot. This would be handy as it'd still allow me to disconnect the shopvac easily for use elsewhere. Easy way to run wire ,if clear hose, is to wrap wire around a small cloth that will fit inside hose. Turn on vac and feed it into hose until almost to vac,then fish it out. IF bare concrete floor, then maybe poke hole in hose before the adapter to shopvac(seal with silicone after),and run to mish mash of conductive metals(maybe one loop around outside of hose to prevent pulling on it?). OR if Desktop is in a fixed position is there any way to maybe drill small hole(or insert wire brushed TapCon) in concrete and put wire in wedging it with a nail or similar? Any bare metal legs nearby in direct contact with floor. Some body who understands VOLT Gremlins and ground loops PLEASE chime in!!! OK. Well I ran some copper wire through the pipes. Attached them to the ground of a plug. And have kept the hose away from any servos. Seems like so far this is a win! Thanks for the help you guys! I now have successful cuts under my belt in a cold environment. This lets me discoonect my shopvac while still ensuring copper flows down that hose as well. OK, now I'm pissed! A $5-$10 neck blank loss is fine. But this was a $50 African Blackwood rosewood fretboard this time! I thought this was addressed. As you can see above, I have grounded everything and the extraction hose no longer runs anywhere near the machine's motors. However, once again, it decided to only screw up when I finally trust it enough again to go do something else while it runs. For some reason it decided to lose Y-steps again while running a 3D path again made in MeshCAM (exact same scenario as previous failure above... ironically on the replacement neck for the previous failure). (Granted, it looks like I needed to set the Z a little lower so the radius'd fretboard goes all the way across the board, not missing the center as seen here). This is so frustrating! Both times this has happened it's been when I haven't been around to watch it. Having a CNC I can't trust to do what it's supposed to do without me watching it really defeats the purpose of having a CNC! Now I'm scared to put anything on it! 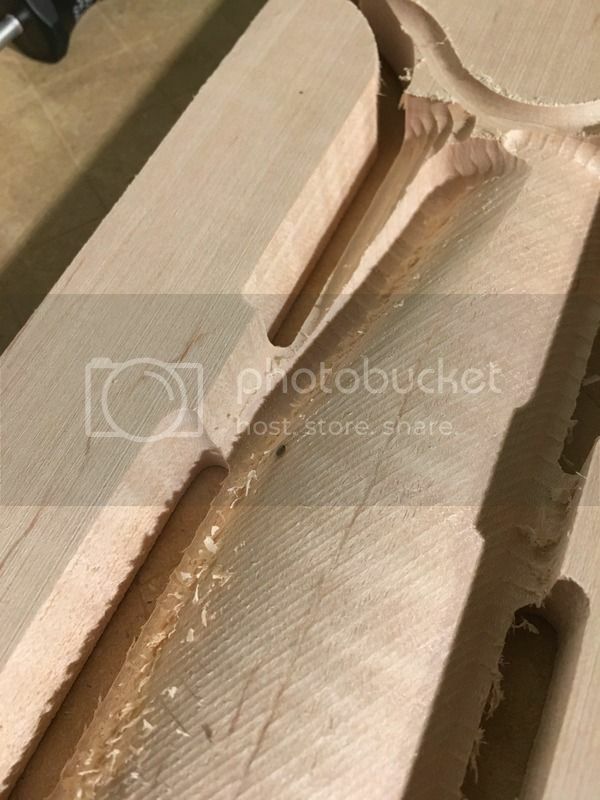 It feels like I have Schrodinger's CNC: it has both destroyed and not destroyed my work until I check on it. Try running a file without your shop vac on. Just get it out of the way. I think it's a static issue. You'll know if you eliminate that possibility. Unless you are using an expensive vacuum like a festool, with an anti static hose, vacuuming chops causes a lot of static buildup and discharge. I finally broke down and called the Shopbot folks. They're thinking it's likely a bearing issue. I one-by-one took the linear bearings off the gantry to test them. I'll upload the videos hopefully tomorrow. See what ya'll think. I think they're right and that at certain, random, points they are binding for some reason and causing these issues.